Swooshing through the sandstone maze of monuments, the 16th century slowly crept up on me - I saw first-hand the genius of Akbar’s thought-process, the meticulousness of Shah-Jahan’s embellishment, and the flamboyance of generations of Mughal Emperors. Mughal Architecture has left us with a heritage of buildings which were not only monumental in their appearances, but also poignant in their inspirations; buildings were built as dedications to people, as symbols of love, or as re-creations of a world far away, a world they left behind in Persia. 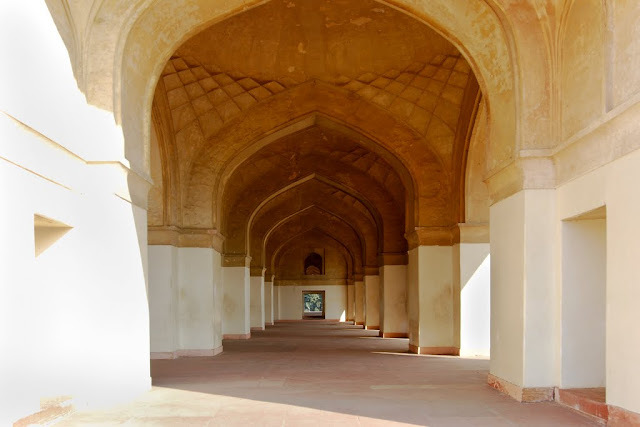 Their architecture, though, was not an imposition on the milieu that existed – the Mughals seamlessly blended and adapted local styles to create architecture that was aesthetically appealing as well as climatically and geographically sensitive. 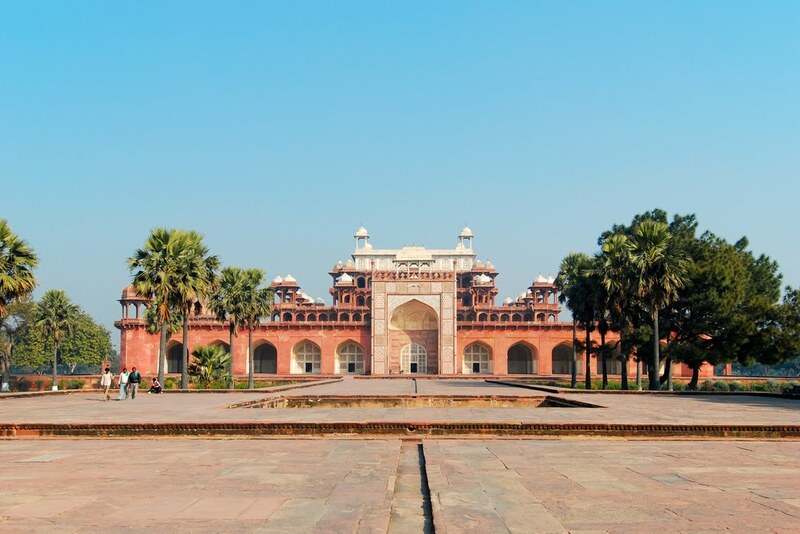 Akbar, the most prolific architect amongst Mughal emperors, has left behind a treasure trove in Agra – a treasure his successors added to. Agra, to most, is synonymous only with the Taj Mahal. Though not begrudging the Taj its status, I feel for visitors who miss out on what is undoubtedly the largest collection of monumental Mughal Architecture in a region – Agra, Sikandra and Fatehpur Sikri – an Agra beyond the Taj Mahal. Early evenings add their own glamour to the red sandstone, setting them aflame. 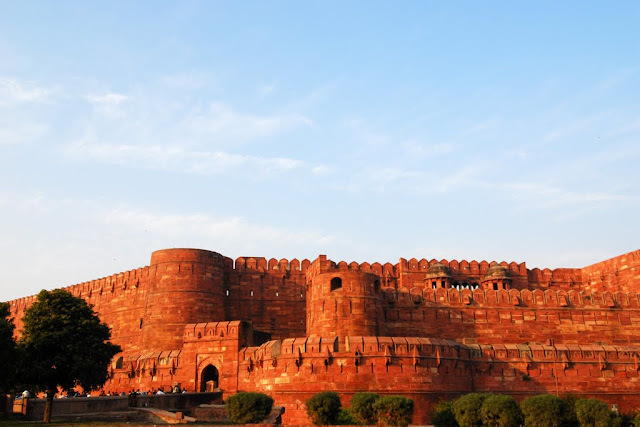 One of the rare forts built on level ground, the Agra Fort looks deceptively easy to breach. Completed in 1573 AD, Akbar and his team designed the semicircular fort over the ruins of an existing fort called ‘Badalgarh’. 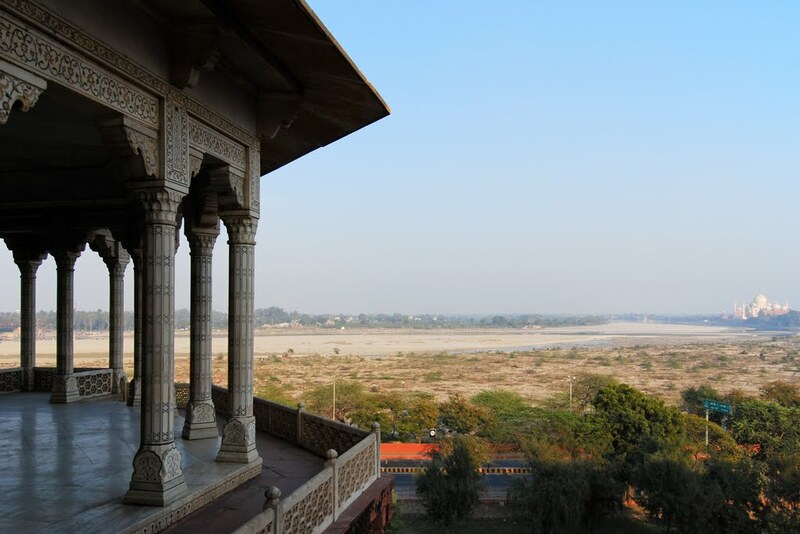 The Yamuna runs parallel to the chord of the semicircle, and was tapped by Akbar for beautiful river-side panoramas from all the buildings lining that edge. The non-river-facing side is where visitors enter from, through the Amar Singh (Lahore) Gate. A steep ramp leads from this gate to the inner gate, but the unexpected work-out was made more bearable by my guide peppering the walk with history and anecdotes about the crocodile-infested moats, the Peacock Throne, and the emperors’ opulent lifestyles. 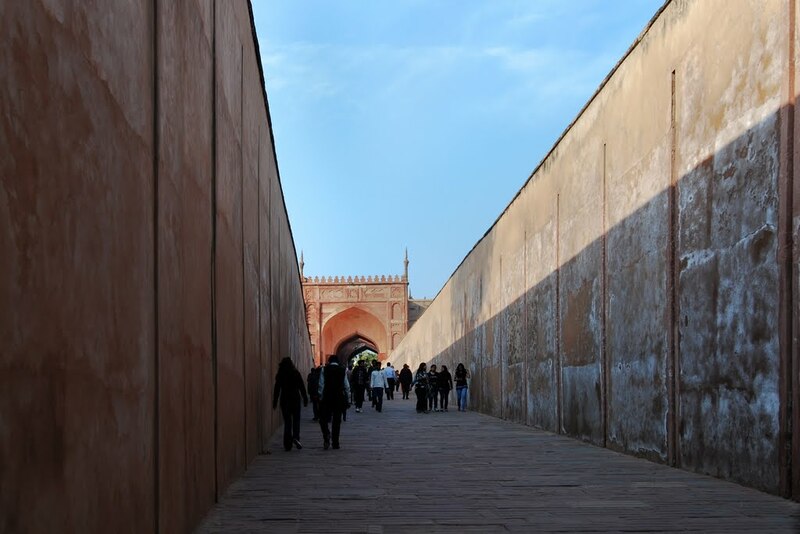 Of the fort’s four gates, the Delhi Gate – the biggest - can only be brought alive through your guide’s stories, as it falls within the inaccessible area of the fort being used by the Indian military. Built by Akbar as his formal entrance, a moat had to be crossed using a drawbridge, to reach the Delhi Gate. From there, the inner gate ‘Hathi Pol’ was reached after a 90 degree turn, so that enemies’ elephants couldn’t run straight through the outer and inner gates to break them down, as was frequently done in battles. Such was the architectural genius employed, which, with other stratagems like a double rampart separated by the 12 m deep moat, 70 feet high walls, forward-sloping lower ramparts to prevent scaling, and massive turrets, made the fort impregnable. Written records sing paeans to the 500 buildings built within, by Akbar. However, his progeny Shah Jahan demolished many of them to make way for his marble buildings – a later evolution in Mughal Architecture. Some of what was spared by Shah Jahan was destroyed by the British in the 19th century, to construct military barracks. Only about 30 of the buildings are said to have survived today. 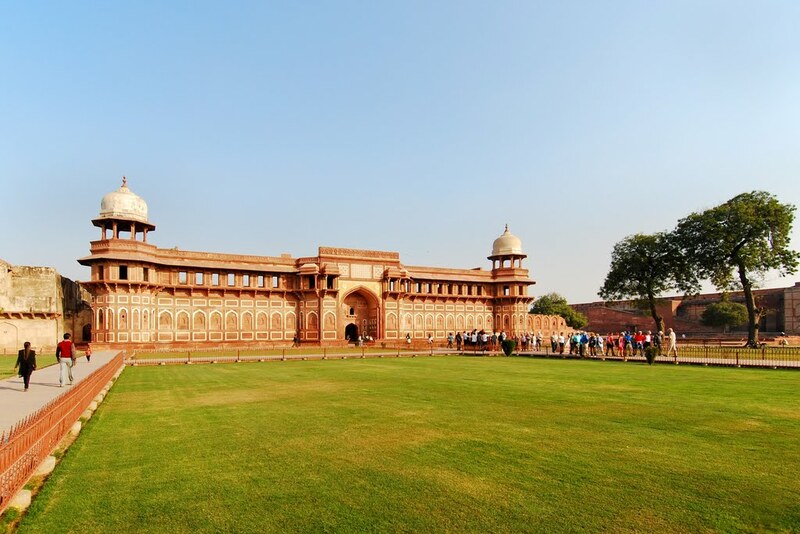 What sets the architecture of the Agra Fort apart from other forts is the presence of expansive, manicured gardens and lawns. Also, the buildings have an interesting mix of architectural styles – Akbar’s initial designs were heavily inspired by the architecture of Gujarat and Bengal, while Shah Jahan used the Indo-Islamic style. Breaking convention, a lot of the surface decorations are non-Islamic - dragons, elephants, and birds - as opposed to the sanctioned calligraphy. Jahangiri Mahal, with one of the fort's many lawns in the foreground. Faint strains of visitors’ chatter and history lessons doled out by copious tour guides followed me through the buildings: Diwan-i-am, Diwan-i-khas, Jahangiri Mahal, Bengali Mahal, Moti Masjid, and Seesh Mahal. At Mussamman Burj, my last stop, a strain of melancholy was added to the air – this octagonal, multi-tiered marble tower was where Shah Jahan was imprisoned by his son Aurangzeb; the tower which probably added to his longing by offering views of the Taj Mahal in the distance; the tower where he breathed his last in 1666 AD. 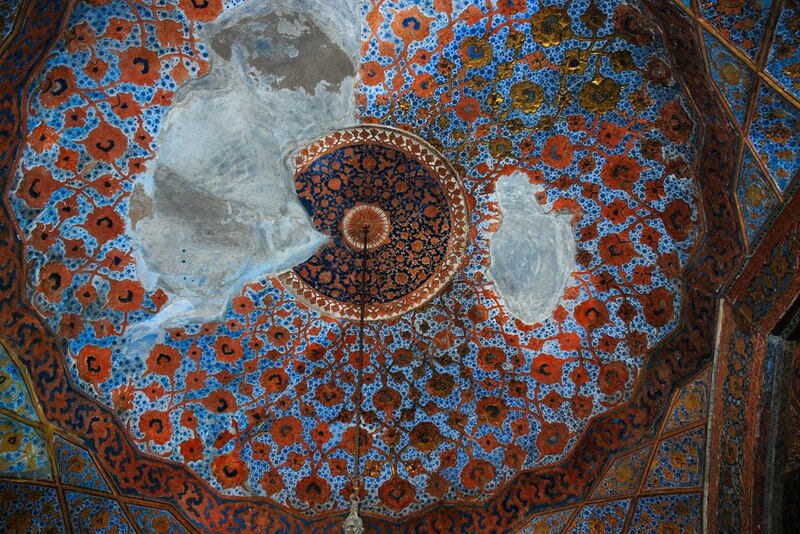 The delicate floral inlay work in the Mussamman Burj almost mocked the harshness of Shah Jahan’s situation. The Taj Mahal and Yamuna, as seen from Mussamman Burj, where Shah Jahan was imprisoned. Walking out of the fort on this poignant note, I looked up at the ramparts one last time. Embrasures (slits) and machicolations (openings) lined the wall, for soldiers to shoot from or throw objects on marauding armies without being shot at in return. Below these, my eye caught remnants of intricate blue and white mosaic work. Had I been a soldier in the marauding army, I most certainly would have been killed by hot oil falling from a machicolation, whilst admiring the craftsmanship! In 1569 AD, childless Akbar was blessed with Prince Salim, as prophesised by the Sufi saint Salim Chisti. 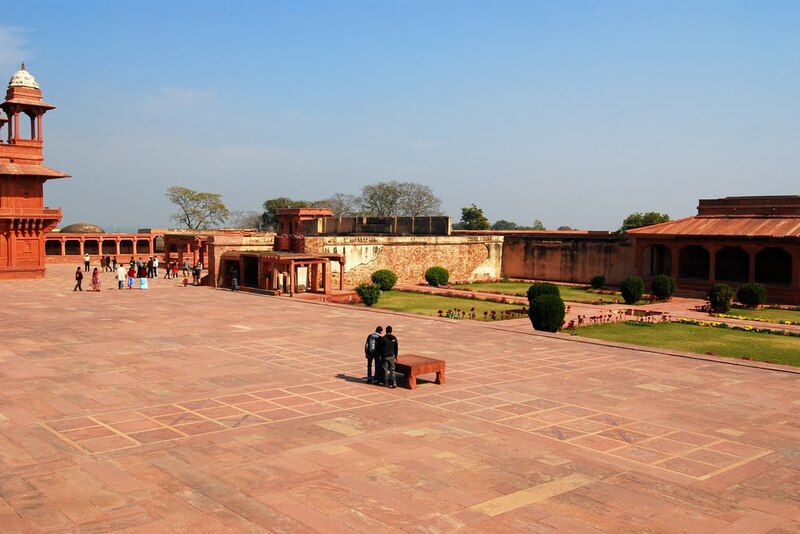 As a token of his respect, Akbar built the Mughals’ first planned city at Sikri, and decided to make it his capital. 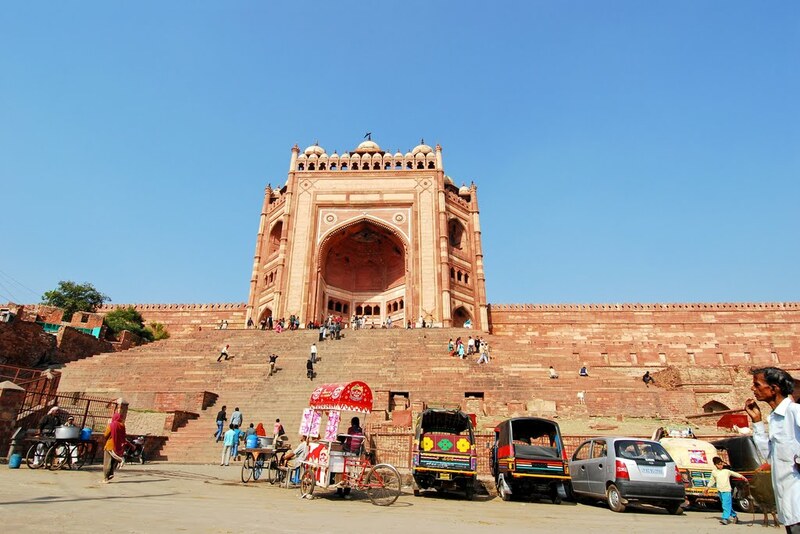 Named Fatehabad, the city later came to be known as Fatehpur Sikri. 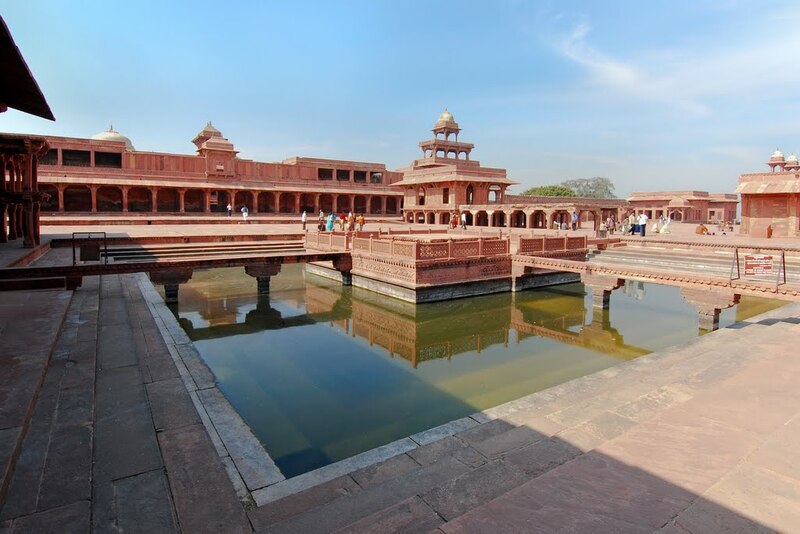 One of the most ephemeral capitals of the Mughal Empire, Fatehpur Sikri was Akbar’s audacious dream – a dream that he lived in for 12 years between 1572 and 1585 AD. Audacious, because, defying conventional wisdom, the city was built on a rocky ridge away from any source of water. Though Akbar did build an artificial lake and devise efficient water supply and drainage systems, Fatehpur Sikri had to be abandoned due to water shortage. 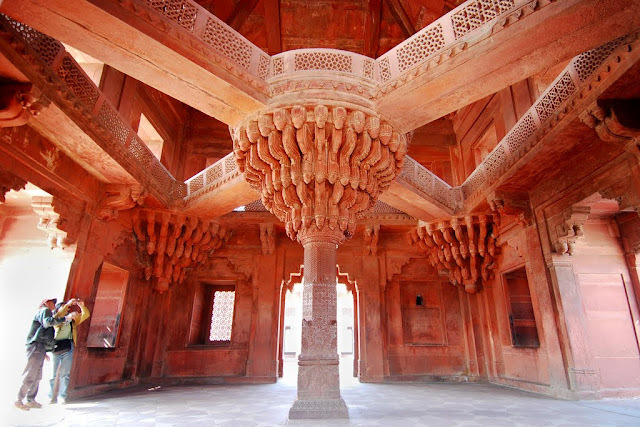 Built entirely using local red sandstone, the architecture of Fatehpur Sikri, as of the Agra Fort, is an assimilation of Persian, Islamic, Hindu and even Jain styles, to create a style that has come to be identified with Akbar. The city was designed to meet all needs – administrative, living, religious, and pleasure – and each of the buildings had unique architectural tweaks. Like how the residences of Akbar’s Hindu and Muslim wives reflect their backgrounds. So does Birbal’s house. Administrative buildings like the Diwan-i-am, Diwan-i-khas, the treasury, and the astrologer’s seat are fairly nondescript, with the exception of my favourite element – the central column in the Diwan-i-khas. 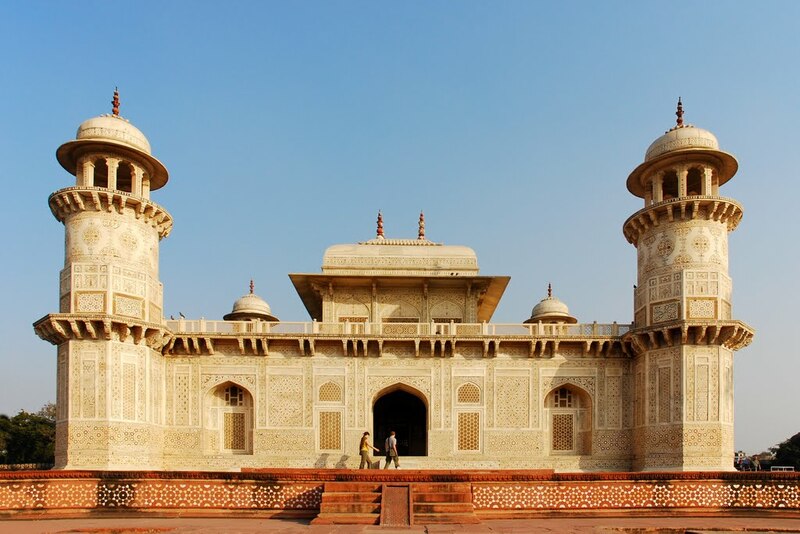 Embellished with bands of carvings, it culminates in a head of 36 serpentine brackets supporting a circular platform where Akbar sat, which is connected to the first floor level via stone walkways. 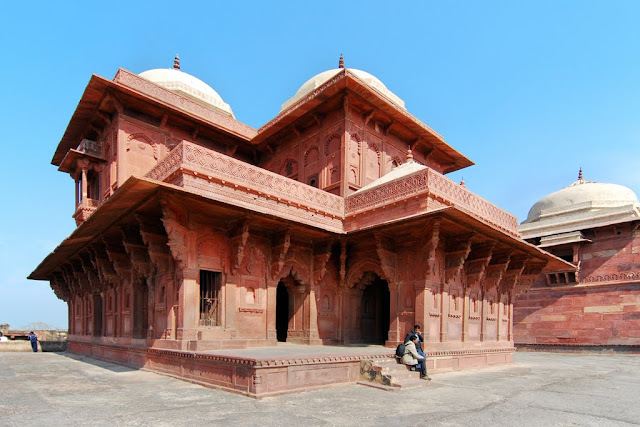 Birbal's house at Fatehpur Sikri, built in a distinctly Hindu style. The central column and bridges inside the Diwan-i-khas. 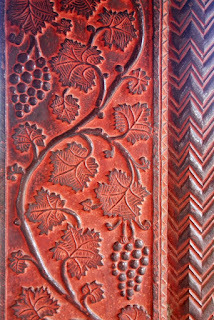 Breaking the sedate architecture of the administrative buildings is the informality of the pleasure and entertainment buildings – with ornate carvings of birds, animals and very life-like grapes and pomegranates. It wasn’t too difficult to picture royal ladies giggling from the ornate 5-tiered Panch Mahal, staff moving at Akbar’s command on the Pachisi (ludo) squares inlaid in the courtyard’s floor, or even musicians performing from the floating platform over Anup Talao’s pool – so evocative was the architecture. 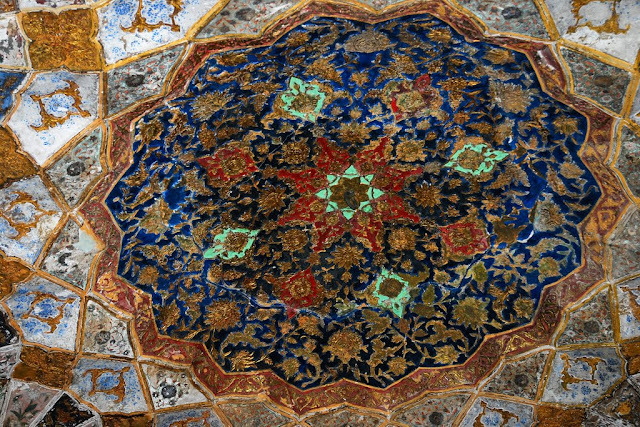 Pachisi squares inlaid in the courtyard, which was played using live courtiers. Anup Talao, with its central platform. 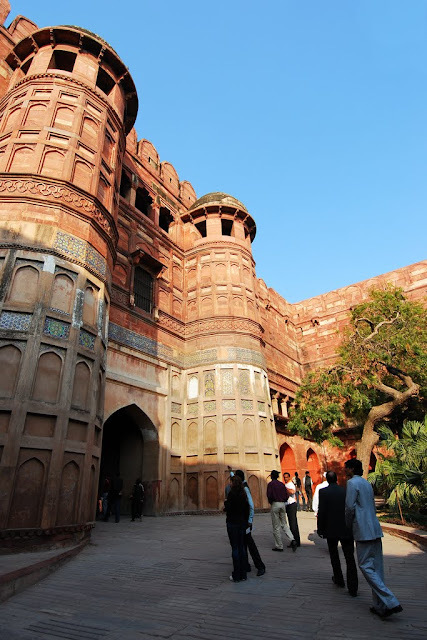 My guide had saved another of my favourites for last – the behemoth that is Buland Darwaza. 180 feet high, equivalent to an 18-storeyed building, this victory arch was added in 1576 AD to commemorate Akbar’s successful campaign. I walked up the steep steps leading to the gateway, which magically transitioned to human scale as I entered the Jama Masjid. Salim Chisti’s white marble tomb within the masjid brought me full circle – face to face with the man for whom this entire city was built. When Jahangir re-inhabited Fatehpur Sikri for a couple of years during his reign, to escape from the plague at Agra, it was the last time the city was ever occupied. Its sparse usage has made it one of the best-preserved collections of Mughal architecture, besides endearing itself to people as the birth-place of the legends of Akbar and his courtiers, the navaratnas. The Agra-Mathura highway to Sikandra snaked through some of the most populated belts of Uttar Pradesh; as vehicles belched noxious fumes into the already insufferable heat, I wondered how Akbar rests in peace amidst this cacophony. As if on cue, a massive, red sandstone gateway came into view; with every inch of it covered in colourful geometric and floral inlays and mosaics, topped with white minarets, the gateway held promise. 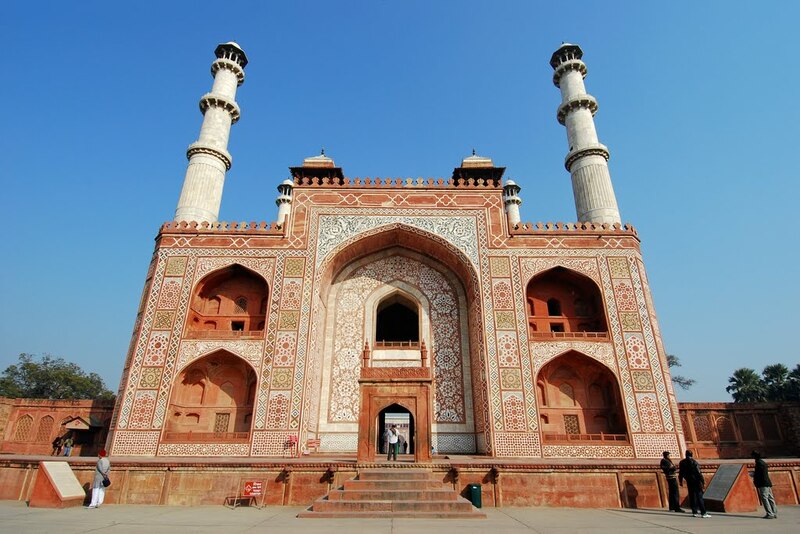 Its architectural elements were precursors to the inlays at Itmad-ud-Daulah and the minarets of the Taj Mahal. The gateway proved to be a portal to another world – leading on to lush gardens which attract antelopes, monkeys, peacocks and other birds. The highway was now a distant memory. Entrance Gateway to Akbar's tomb, with ornate inlay work. In accordance with the Tartary custom of building one’s own tomb, Akbar set about its construction in 1600 AD. Unfortunately, he passed away in 1605 AD, after completing his tomb and laying out the gardens in the typical char bagh pattern. His son Jahangir took over until its completion in 1613 AD. Broad, paved walkways with channels and pools (which once had water) lead from each of the four gates to the stepped, 5-storeyed red sandstone building. 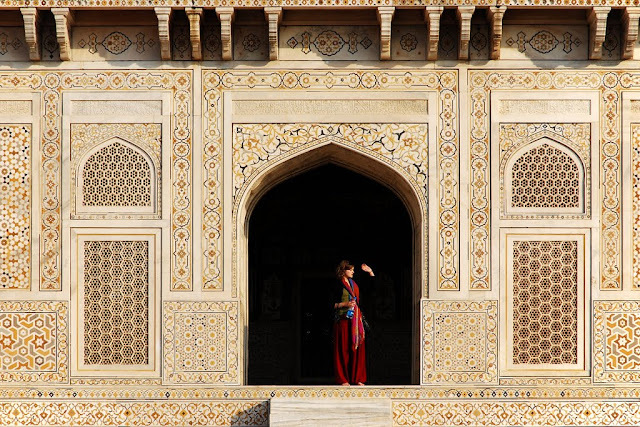 The uppermost storey is in white marble – Jahangir’s signature touch to the design. An unusually squat building by Mughal standards, its linearity adds to its distinctive character, which is enhanced by the presence of arcaded verandahs on all storeys, as well as kiosks capped by cupolas (chhatris). View of Akbar’s tomb with the paved walkway, water pools and water channels. The interior of the building sends mixed signals – I was greeted by strikingly rich stucco work in blue, red and gold, only to move through a narrow, white-washed passage, to a white-washed room with the false cenotaph. The mystery of the severe interiors was solved by my guide - Jahangir is said to have brought his ostentatious design sensibilities to the tomb’s interior design; unfortunately, only bits of the stucco and none of the precious-stone inlays survived, as the tomb was heavily looted and disfigured during the reign of Aurangzeb, by rebel Jats. 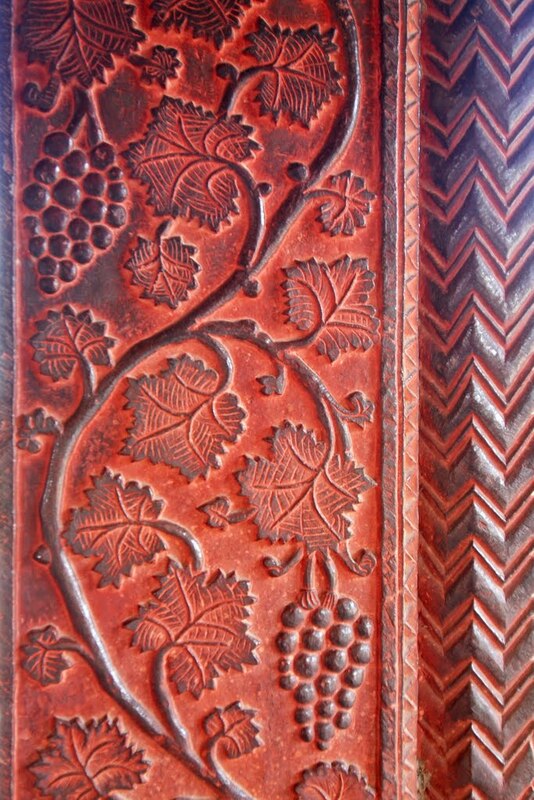 Jaalis (lattices) in sandstone, pre-dating and competing with the finesse of the marble lattices at the Taj Mahal and Itmad-ud-Daulah, lend a delicacy to the architecture, which lingers with you. 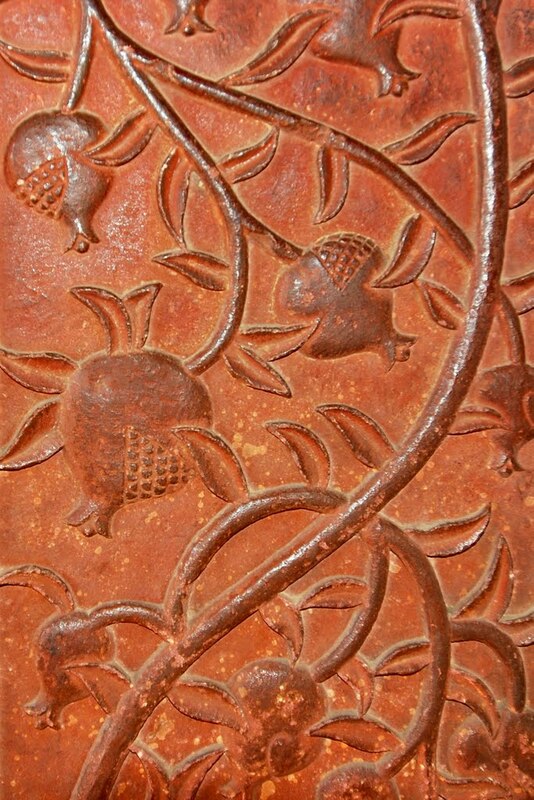 One of the surviving examples of the elaborate ornamentation executed by Jahangir within the building. White-washed interiors of the tomb. Driving across the Yamuna is an exercise that demands your patience, but rewards you well. This little-visited area of Agra is home to a landmark building which marked the transition of monumental Mughal Architecture from its first ‘sandstone phase’, to its next, which was marble architecture. Pint-sized Itmad-ud-Daulah packs quite an architectural punch with its design and detailing, envisioned and executed lovingly by Jahangir’s wife, Empress Nur Jahan, for her deceased father Mirza Ghiyas Beg. A Persian Amir in exile, Ghiyas Beg had been a Wazir in Jahangir’s court and was conferred the title of Itmad-ud-Daulah (pillar of the state). 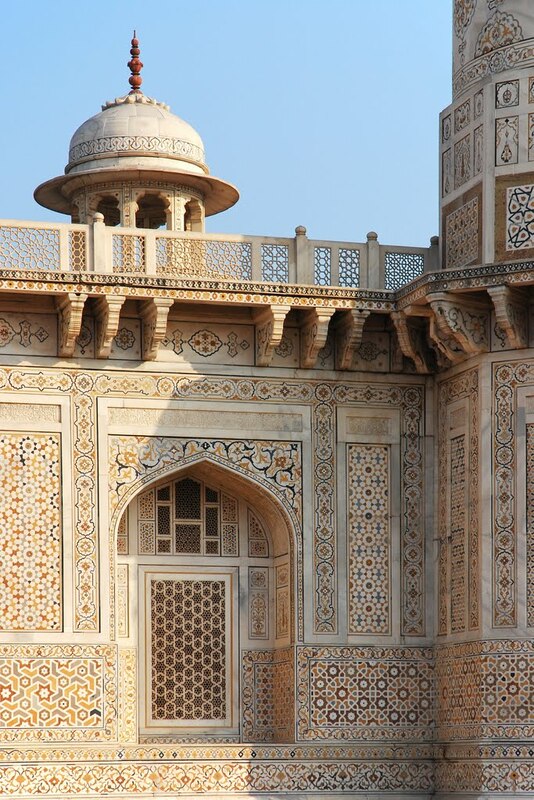 This marble tomb is a predecessor to the Taj Mahal, and is said to be its inspiration too. To reflect her father’s love for Persia, Nur Jahan borrowed heavily from Persian architectural and interior decoration styles, while adding Indian elements like chhatris and kalash-shaped finials. The dome-less building set on a red sandstone plinth within a char bagh garden, has hexagonal towers in each corner. The overall proportions and ornamentation of the mausoleum led to it being nicknamed ‘Jewel Box’ and ‘Baby Taj’. 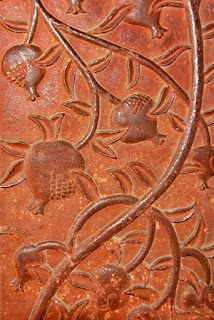 The building’s white Rajasthani marble surfaces are covered painstakingly with floral arabesques and geometric motifs using inlay and mosaic techniques. One sees the extensive use of the pietra dura technique with semi-precious stones, which was later employed at a much larger scale in the Taj Mahal. Another important architectural milestone is the polychromatic nature of the ornamentation. Jahangir’s influence can be seen in the choice of Iranian motifs like wine goblets, bouquets and cut fruits. Don’t miss the beautifully painted dome when you enter the tomb. It’s worn out, but still displays some of the original colours – brilliant blue, turquoise, red and gold. Marble jaalis are used strategically to create tailored light and shadows within, presenting a solemn air in contrast to the almost cheery exteriors. Cheer we must, though, for this path-breaking example of the second phase of Mughal Architecture. Architecture is the least esoteric way for people to understand a time-period – it doesn’t require knowledge of exotic languages needed to interpret written text, nor does it need familiarity with technical details of art. Architecture conveys messages across centuries without the need for sharing common ground. Agra offers you tête-a-têtes with Akbar, Jahangir and Shah Jahan; it is up to you to accept the invitation.